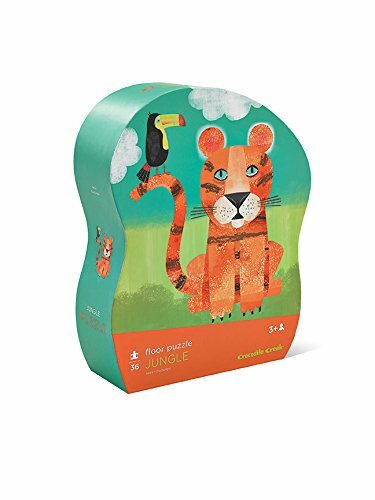 Crocodile Creek's Jungle themed 36 piece floor jigsaw puzzle will delight all ages. The 20" x 27" floor puzzle is not only significant in size but also has beautiful, colorful and complex illustrations. All Crocodile Creek's puzzles are printed with soy-based ink on recycled cardboard. Uniquely shaped storage box is study and will keep all the pieces together when the puzzle is not in use. • Finished puzzle size is 27" long x 20" high. • Beautifully illustrated artwork on both puzzle and shaped storage box. • 36 thick puzzles pieces that fit together well for kids ages 3 and up. • Puzzle pieces are made of strong, high-quality blue board that will not tear or break. Printed with soy-based inks. • Encourages hand-eye coordination, fine motor skills and problem solving.